22 buses, 4 trams, 6 trains, 8 counties, 4 Hanover House guest rooms, 3 libraries, 16 Wetherspoons and glorious sunshine over 7 days constituted Bus Pass Trip 12 which was my fourth and final trip this year. Rail fares and accommodation totalled £130 and, as ever, bus travel was completely free. I ventured through Nottinghamshire, Leicestershire, Northamptonshire, Buckinghamshire, Oxfordshire, Berkshire, Greater London and Kent and spent progressively more money the further south I went. I dread to think what my Wetherspoons bill will amount to! The 3 Local Studies libraries I visited (to research theatres where my great-grandmother had performed) were in Northampton, Reading and Croydon and produced varied amounts of information. I discovered that The Royal theatre in Northampton is still a ‘working’ theatre, though it was closed for renovation at the time, so a return visit to attend a future performance is a ‘must’. My Hanover sleep-overs were in Loughborough, Northampton, Henley-on-Thames and Windsor, where I managed to watch the changing of the guard at Windsor Castle. It was an incredibly hot day and I certainly didn’t envy the guardsmen wearing their red double-breasted tunics and bearskins. From there I travelled to Folkestone to spend a couple of nights with a friend before returning, 1st Class, by train to Manchester! I switch from the ridiculous to the sublime! In addition to 2 beach cleans I picked up dozens of pieces of rubbish and, as most of you are aware, posted very exciting pictures of them on Social Media. Ha-ha!! I engaged in ‘rubbish’ conversations with some very interesting people, including Dave Brubeck’s daughter-in-law, Catherine (wife of Darius Brubeck, Jazz pianist in the Darius Brubeck Quartet) and Catherine Bell, head of Broadcast Systems, Europe & Africa, for Fox Networks Group. Some TV publicity for my new role as Litter Heroes Ambassador for Keep Britain Tidy would be nice! I’m always very conscious that I rarely have either time or Wi-Fi connection to respond to all your messages, likes and retweets, but I assure you that I’m always very grateful for your continued support and encouragement. Once again, I’ve visited many new places, twisted the arms of new recruits and had the greatest fun. It’s a rubbish life but someone has to do it!!!! And finally, to all you wonderful ‘eco-warriors’ doing your bit, please remember to never let small minds convince you that your dreams are too big! Thank you and much love to you all. Author Ruth MajorPosted on 7th September 2018 Categories UncategorisedLeave a comment on It’s The Final Countdown…! Bus Pass Trip number 11 encompassed 6 days through 5 Counties, namely Greater Manchester, West Yorkshire, South Yorkshire, Lincolnshire and Nottinghamshire. Altogether I travelled on 18 buses, one tram and one train, made necessary when I missed the last bus from Doncaster to Retford, due to a late connection from Sheffield. The short train journey, of about 15 minutes, cost £7.85 and that included a 30% Senior Railcard reduction so it’s not surprising that train travel isn’t popular. As ever, travelling by bus cost me nothing! Hanover Housing Association guest rooms, two in Bradford and one in Barnsley, cost me the grand total of £27.50. Thank you, Hanover! My adventure was, once again, based around visiting several Local Studies Libraries to continue my genealogy research. These included Halifax, Huddersfield, Bradford, Barnsley, Gainsborough and Sheffield and although the results of my searches weren’t exceptionally fruitful they were nonetheless interesting and aided, in the main, by some very helpful and knowledgeable local librarians. The most glorious of weather made my trip through our beautiful countryside all the more enjoyable, but it’s thirsty work jumping on and off buses so I’m afraid I had to frequent a total of 12 Wetherspoons establishments for refreshments. Any excuse! 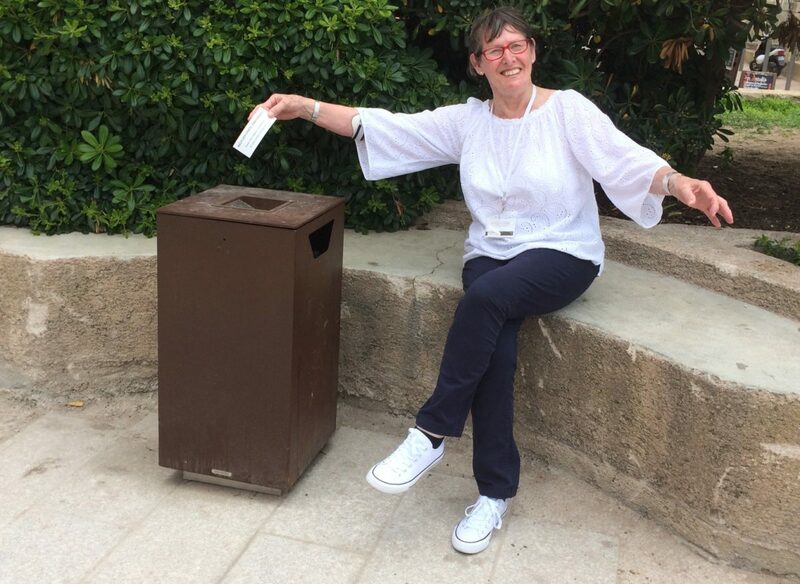 And finally, as the main focus of my travels is to promote the #1PieceOfRubbish campaign, I tried to encourage my fellow travellers, drinkers, diners, pedestrians, librarians, Hanover residents and a few England football supporters to do their bit! How successful I’ve been is impossible to assess but I’ve had another exciting adventure, visited many new places and met some amazing people. Kathleen, on a bus from Barnsley to Doncaster, was delighted that I’d provided her with a topic for her talk to the ladies group at her local church; Paul Redfern, an actor from Retford, posted a very supportive comment and my Social Media details on Facebook; Halifax Visitor Centre promoted the campaign on their website and Louise from Halifax ran across the road to take a photo of my backpack sign, gave me a huge hug and vowed to spread the campaign on her Instagram page. Thank you to all my fellow litter pickers and supporters for your posts, tweets, retweets and messages of encouragement. I’ve loved every minute of my journey and I love you all for ‘following’ me. Bus Pass Trip 12 is already in the planning stage. I can’t wait!!! Day 1…Here we go, here we go, here we go….Setting off in the sunshine & saying goodbye to Syed…. …..then Oldham to Rochdale to Halifax to Bradford….and feet up to watch the footie! Day 3… Another genealogy day: Bradford (Library)to Leeds to Barnsley(Local Studies) …& a cold beer! This litter picking is thirsty work & Twinkle Toes were tired! Day 4… Hanover News (advertising the campaign) in Barnsley guest room, rubbish in Doncaster & Gainsborough & a rest on the road to Retford! Day 5…Retford to Worksop to Dinnington to Sheffield Library – and a little rest for Twinkle Toes during my genealogy research. Day 6…& safely home! Bargain butty at Car Boot Sale ..Dropping into the bin at Maltby…’Diving’ into the bin at Doncaster….& totally missing the bin in Oldham Centre. It was an unholy mess! Apparently, I’m one in a hundred! Hello and Congratulations! I’m delighted to let you know that you have been successful with your application to join our #LitterHeroes Ambassador Programme. Author Ruth MajorPosted on 30th June 2018 Categories UncategorisedLeave a comment on Watch the car….! What a blast Bus Pass Trip 10 proved to be! Brilliant weather, beautiful scenery, blossom blooming and buses on time! This was a 7-day journey through the ‘rose’ counties of Lancashire and Yorkshire (except for a brief foray into Mersyside) and I did my utmost to make peace, not war, even when gently chastising the occasional litter lout. My itinerary included visiting Rochdale, Bolton, Blackburn, Accrington, Burnley, Skipton, Keighley, Bradford, Ilkley, Otley, Harrogate, Ripon, Boroughbridge, Colne, Chorley, Southport, Ormskirk, Wigan and Manchester, before returning home to Oldham. I travelled by 28 buses, 2 trams, 1 train and 3 cars, stayed in 4 Hanover Housing Guest Rooms, spent 2 nights with Janet & Co. in Boroughbridge, dined out with Jo & Frank at the Taste of Greece café in Bolton, visited 15 Wetherspoons pubs and did family history research in 5 Local Studies Libraries, namely Accrington, Keighley, Colne, Blackburn and Southport. My accommodation totalled £49.50 and, as usual, my transport cost was Zilch. However, as yet, I haven’t dared to tally my Wetherspoons bill! Some wonderful people I met along the way have been both encouraging and inspirational: Dr Morag Rose, a ‘Loiterer’ (Google it!) in Manchester who was excited to take a photograph of my tatty #1PieceOfRubbish flag (and she posted it on Twitter! ); Sam, in Southport, who promised that he and his ‘drone’ would locate and lift rubbish (and he has kept his word! ); a lovely lady librarian in Blackburn Library who sought out lots of information about the Theatre Royal where my great-grandmother had performed in 1882; and Sue, the Estate Manager at Rydal Court, Hanover Housing, Bolton who was so interested in hearing about my travels that she was very late going home for tea! As ever, I have received numerous messages of support, ‘likes’, ‘shares’, ‘retweets’ and ‘reposts’, on Facebook, Twitter & Instagram, to help me along my way – and, as ever, I tender my apologies for not replying to you all in person. I hope I’ve made a minute difference to the world, I hope I’ve encouraged a few new recruits and I hope I’ve left only a shadow in my wake. I’ve certainly talked a ‘load of rubbish’ – but then I always do!!!! Author Ruth MajorPosted on 26th June 2018 27th June 2018 Categories UncategorisedLeave a comment on Fame At Last! Eat Your Heart Out, Netflix! Author Ruth MajorPosted on 26th June 2018 26th June 2018 Categories UncategorisedLeave a comment on Eat Your Heart Out, Netflix!